In the last couple of weeks I took a shot at a couple of big live tournaments at my local cardroom, Dusk Till Dawn. I don't really get the chance to play big live tournaments very often, as I don't like to leave my wife and kids, so took the chance to play these two that were close-by, where I can sleep at home, and I happened to go deep in both of them. 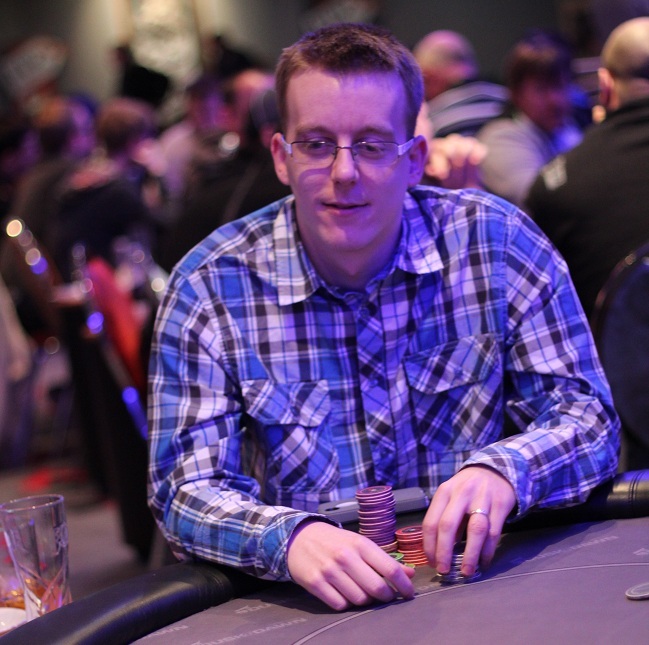 First off was the £500 Monthly Deepstack that this time around drew 643 entries for a ~£320,000 prize-pool. Being a re-entry tournament, I went into it willing to fire the full 4 bullets over the 2 starting days. I busto'd my first bullet in a standard flip, and re-entered when a stack was worth about 30bbs. I ran pretty good, and I ended up going into Day 2 12/186 remaining. Day 2 was pretty fun. I was playing well, I picked up some big hands in good spots, and I was in or amongst the chip leaders for much of the day. I bust Roberto Romanello when he shoved something like 9 bbs in MP and I called with 33 in the big blind, and the board ran out K, 9, 3, 3, x. I also ended up sharing a table with the legendary Devilfish. The structure of the tournament meant it kind of descended into a crap-shoot from 3 tables out, where the average stack became ~15bbs. Of course, this suited me fine and it was highly likely I was the best player left with this kind of stack. Unfortunately for me, I saved my run-bad for the most pivotal point in the tournament. I lost a flip when I opened KT in the cut-off and Maria Demetriou made the obligatory 7bb shove with 88. Then with 16 left I made a reship on the button vs a 6bb UTG shove with A8 and was up against 89s, only for the door card to be the 9. With my remaining 7bbs I somehow managed to pick up AQs in early position when I was just hoping for cards that were in some way connected! Obv the eventual winner is sat to my left with KK and it's gg me. With payouts of £85k/£50k/£30k/£20k for 1st-4th respectively, I was pretty gutted when I bust for a paltry (relatively speaking) £2.5k in 15th place. I have to play A LOT of SNGs to make that kind of money, and I was starting to smell it. Win any one of those 3 hands and I have a decent shot, but sigh, that's tournament poker for you. As they say; standard. 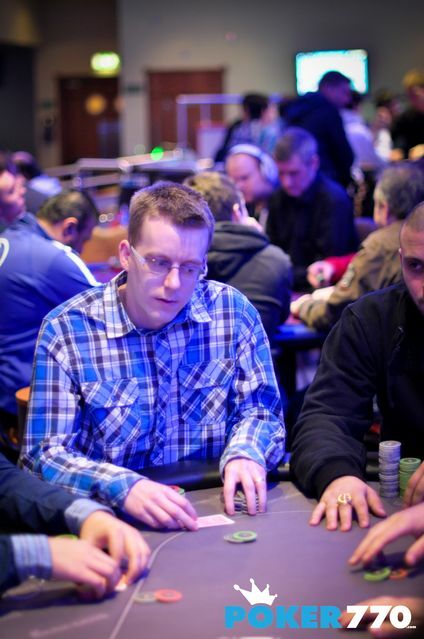 After deciding I was going to retire from live poker that evening, I managed to perk myself up again to come out of retirement and play the next tournament (The €700+70 Poker 770 Mega Poker Series) 4 days later. With starting stacks of 770 big blinds, and 77 minutes per level, this was set to be a gruelling affair if things were to go well (despite this sick structure I still managed to not get dealt AA for the whole tournament, FML!). And go well they did. I got an excellent first table draw, with only a couple of good players, one of which was on my right. I built my way up to 180k (from 77k) in chips in Day 1 and was well above average going into Day 2. I managed to bodge my first hand back on Day Two. I 3b an oldish guy who raised the C.O. from the button with 58s. My c-bet on 9J7 didn't work, but I binked the T on the turn. He check-raises me and I want to puke. Maybe I can just fold against said villain. The board paired on the river and he bets. Easy fold right? But sigh, he bet small and I was getting 4 to 1 or something and called. He obv had KQ and the table immediately broke after this hand. It was probably a good thing to prevent me steaming after losing 2/5 my stack in a stupid spot. Most will probably know James Atkin as "epitomised" and he has been a force to be reckoned online whilst trying to find the way back into the grind at the live tables. After the spectacular 3way set and River Quads, the Belgian Xavier Charlier has been using his big stack to push around the table, but he was just caught by Atkin with the fingers in the cookie jar. Preflop, epitomised raises from the Hijack to 4,200 in Level 10 at Blinds 1,000-2,000 / Ante 300 and the 770 Pro reraises to 10,000 from the Button. 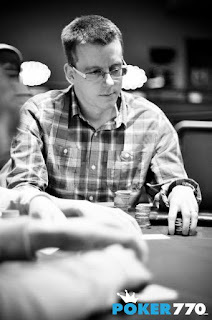 The Blinds get out of the way, but Atkin 4bets to 22,000 and gets called to go Heads-Up to the Flop 10♠ 3♦ Q♣. The Brit check-calls 30,000 and once the 9♥ hit the Turn, the 770 Pro fires the next barrel for 60k. Atkin only had 80k behind and didn't even think about folding in the spot, the Belgian has to call off another 20k and flips over K♣ 5♣for a total bluff on the flop and a gutshot on the Turn. He is not drawing dead yet against the K♠ 10♥ of Atkin, but he cannot scoop the pot anymore and only split with a Jack on the River. The miracle doesn't happen and James Atkin bumps his stack up to ~290,000 in Chips, whereas the 770 Pro falls below that stack. I made another good play 2 or 3 levels later where I peeled an EP open with AJs, only to be 3-bet by an overly aggressive bad player in the CO. When the original raiser folded I made what would be a suspicious 4-bet, intending to induce. He obliged, and shipped all-in for just over 100bbs total. I snapped and he had ATs. It felt pretty heroic to call a 5-bet shove with AJs for a ridiculous amount of big blinds and be right, but obv he binked a ten. From that point on in the tournament I was nursing an under-average stack, but this was still 20-30 big blinds and I clung on and clung on mostly in preflop wars. I survived with 66 vs AJ when I 3b jammed on the #1 ranked PocketFives player Chistopher 'NigDawg' Brammer, and later just about survived the money bubble which is where the day ended, with me placed 32nd/36 remaining. Early on in Day 3, expecting the min-cash and the drive home 30-minutes later, I actually managed to win a couple of flips to keep me in contention. 55 vs A6s blind vs blind, then AK vs AJ & TT. Day 3 was all about preflop wars and I barely recall showing down a hand after these two flips. I clung on and clung on, and I was about 8th with 10 remaining, and happy to have a shot at making the final table. I'd shipped the button vs the cut-off for 20bbs the orbit before, and he opens the cut-off again for 40k at 10k/20k(2k). I look down at JJ and I'm like, wiiiiiiiiiii. I jam again. He calls and I'm still reasonably happy, but he has QQ, FML. So I bubbled the final table and again fell short of the big money with £35k/£21k/£13k the payouts this time. Despite feeling pretty crushed at missing out on two big final tables, there were good things to take from all this live poker. It was really good to catch up with some of my friends on the circuit. As many of you will know, grinding online is so bloody isolating, and it was nice to have some real humans to talk to. It was cool to share a table with some guys I get on well with, like Simon Deadman, Marc Wright, Andrew Hulme (who came 2nd, congrats!) and I even got to share a table with my old friend Mickey Wernick who I hadn't seen in a long time. Not to mention managed to grab a Nandos with my long-time friend Dan Carter and the hero that is John Eames. 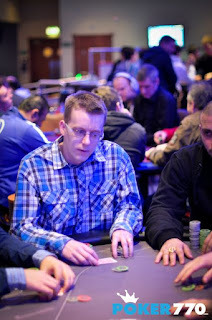 I was also pleased to get the proverbial "duck off my back", in that I hadn't cashed in a live poker tournament since I binked a side-event at the Galway UKIPT in December 2009. That featured 26 tournaments without a cash which must be somewhere around the bottom of variance considering how 'lol' live poker is (although the last 12 or so of the Poker 770 were incredibly tough, shows that cream rises to the top in a structure of that nature!). At least my Hendon Mob page now reflects that I am still around. Also, 2 small cashes is obviously better than just losing. Although it still doesn't quite seem like sufficient reward for approximately 45 hours of gruelling live poker! Oh well, nevermind. It's back to the online grind for me after seemingly having barely played this year. I don't think I'll retire from live poker again just yet, as the £700+70 UKIPT in Nottingham has just been guaranteed at £1 million by Dusk Till Dawn. Third time lucky? 1 Comment to "Lol (live) donkaments..."